Your roof is old, and the shingles are starting to buckle and have lost their protective coating. You decide you can do it yourself in a couple of weekends. You make the decision not to take off the old roof but to shingle over the top of the first roof to save time and effort. However, what you didn’t realize was that the decking under the first layer had started to rot in some spots due to leaks that had gone undetected. In just a few years, you end up having to pay a company to fix the problem anyway. You ask a crew of friends to help re-roof your house in exchange for a similar favor in the future. You get the old roof off and everything replaced without too much trouble. But in the process, one guy hurts his back. He is a friend of a friend, so he has little loyalty to you. He decides to sue you because the injury interferes with his job and he can’t file for worker’s compensation. You try roofing yourself but end up falling and breaking a leg. It’s a good thing you didn’t lose your life, but you have expensive hospital bills on top of needing a new roof. You carefully price out all of your material costs, figuring that you will save a bundle on labor costs in exchange for re-roofing your house yourself. 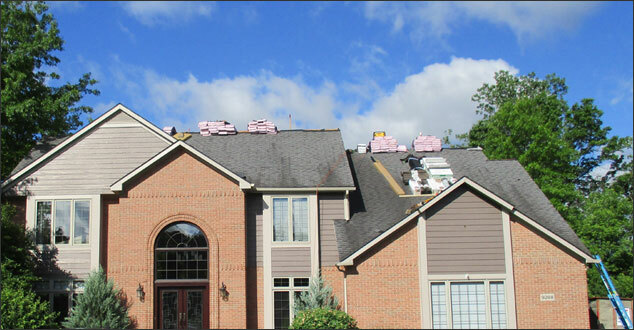 What you fail to consider is that you are paying much more in material costs as an individual because you don’t order in bulk the way professional roofing companies do. In addition, the tools needed are expensive, and you don’t know anyone who has them. After spending all this money, you have committed to doing it yourself. You also fail to consider the value of your own time in lost-opportunity costs when you end up having to take vacation time to get it done. You also have a family who is mad at you for using up vacation time for roofing. You start the project yourself but it quickly becomes more than you can handle. Unfortunately, you end up with a partially-exposed roof covered in a tarp for months while you’re scrambling to fit this project into your busy schedule. Eventually, the wet decking starts to rot and allows moisture into the attic. Then, mold grows in your walls. You end up having to pay colossal remediation fees and hire a professional roofing company to finish installing your roof; or, more likely, start over. Your roof will be inspected for leaks, potential problem areas, and overall health. You will get a recommendation for the solution; from a full replacement to the patches and maintenance your roof needs to extend its life. You will have access to many choices of colors and styles that fit within your budget and knowledge that the correct installation and underlayment materials come standard with each job. Your old roof will be removed entirely, damaged decking replaced, and a new roof installed in two to three days. You won’t have to clean up any nails or shingles in your yard, and you will not have to risk your life or limbs in the process. Professional roofers have plenty of experience working in this risky environment, and they know how to avoid the most common risks. A professional company pays its roofers a good wage and has insurance coverage in case of injury on the job; protecting you from liability. Hopefully, after reading through some of the above scenarios which, we can assure you, have happened to homeowners, you will reconsider replacing your roof yourself. If your home is located in Southeast Michigan, please give us a call. We would be honored to help! ‹ Top Traits of Our Ideal Customers: Are You The Right Fit?